On 19 February 1937, an Airlines of Australia Stinson aircraft carrying five passengers and two pilots disappeared during a scheduled trip from Brisbane to Sydney. The disappearance remained a mystery for more than a week but thanks to the ingenuity and skill of Bernard O’Reilly, a bushman from O’Reilly’s Guesthouse on the Lamington Plateau, the crash site was discovered in the McPherson Range on the border between Queensland and New South Wales. Unlike other searchers, O’Reilly believed that the plane was unlikely to have travelled very far south of the Queensland-New South Wales border and he set off through the bush on foot from the Guesthouse to check the accuracy of his theory. After camping out overnight he discovered the crash site. 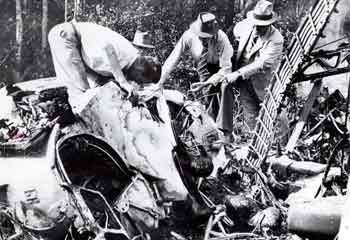 There were three survivors but four others perished in the crash. One of the survivors was killed in a fall when setting out for help. Bernard O’Reilly was acknowledged as an authentic hero. On 11 March, he was greeted by a large crowd at Sydney Town Hall and presented with a cheque for £1200 raised by public subscription. Even the Australian Women’s Weekly (13 March 1937) made a contribution, with an article ‘Romance of Mrs. Bernard O’Reilly: charming wife of Australia’s No. 1 hero and her daily life’. During his life, O’Reilly wrote a number of books, one of which was Green Mountains (originally published in 1940) that included details of his search for the survivors of the Stinson crash. Understandably, the Stinson crash led to an examination of the causes of the crash and the adequacy of the search procedures. The Brisbane City Coroner, JJ Leahy, was appointed to undertake an inquest into the crash. Leahy reported on 16 April 1937. The inquest documents included a map of the crash area; a photograph of the interior of the aircraft; and Bernard O’Reilly’s witness statement to the inquest. A 1987 Australian television movie, ‘The Riddle of the Stinson’ (complete film), starring Jack Thompson as Bernard O’Reilly, told the story of the Stinson crash and the rescue. Jock Given of Swinburne University has an article on the Stimson story in Meanjin Winter 2017 (paywall on electronic version).